Our Lucious. Our Plush. Our Thick and Thirsty, Soft Bamboo Hooded Baby Towels couldn't make us any more proud. The generous size of 85cm x 85cm (approx) is going to follow your Newborn up to about 18 months. 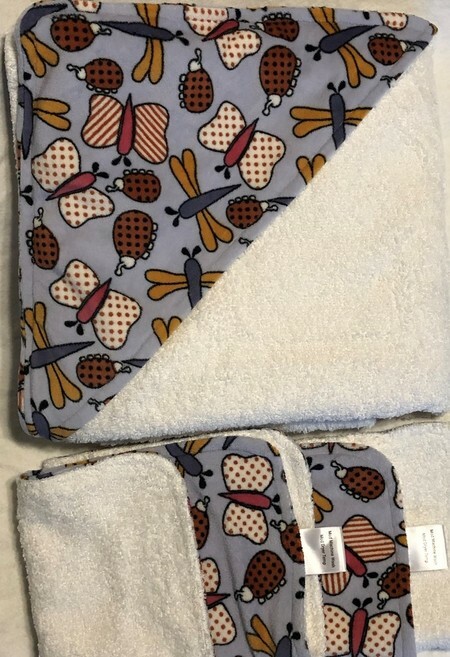 Each Towel Set includes a Large Hooded Baby Towel and 2 Face Washers, in either matching or contrasting colours - with the same Terry Cloth as the Towel. Bamboo Terry (94% Bamboo/6% Polyester) is Anti Fungal, Anti-Microbial, Plush, Fast Drying, Extremely Absorbent and will dry baby off in no time at all. Some people like Bamboo if they have skin conditions; some people like Bamboo Fabrics for their softness and absorption. The manufacturing process of Bamboo Fabrics is extremely kind on the environment as there are no chemicals used during the process. We will be offering 3 Types of Bamboo Terry in our Hooded Baby Towel Range. These are our Mid Range Towels (the thread used for the embroidery and construction of the towels are both Polyester). We have a small selection of Hood Designs in this particular Terry Cloth Range. The Minky in this towel is so soft to touch, in a fun Butterfly design, and can be seen on the hood and back of the towel, as well as on both Face Washers.